Bengaluru: Flipkart has bought back shares worth $350 million from several minority investors, including DST Global, IDG Ventures and ICONIQ Capital, as India’s most valuable internet start-up prepares to sell a majority stake to Walmart Inc. The country’s largest online retailer has bought back about 1.9 million preference shares from minority investors in a transaction that values Flipkart at $17.69 billion, according to documents filed with Singapore’s Accounting and Corporate Regulatory Authority that were sourced from data intelligence platform Paper.VC. According to the documents, the buyback is a significant step towards Flipkart converting itself into a private company as per Singapore law, paving the way for its proposed sale to Walmart. This is the second such transaction in the past 12 months, although in the latest instance, a number of minority Flipkart shareholders have been handed complete exits. In August, most of Flipkart’s minority shareholders sold a portion of their stakes to SoftBank, which pumped in roughly $2.5 billion in Flipkart to buy primary and secondary shares in the online retailer. Some of the individual investors who have sold their shareholdings in Flipkart completely in the latest buyback include Accel’s Shekhar Kirani and SoftBank’s Deep Nishar. A large number of pension funds have also exited as part of the latest deal. Most of Flipkart’s large investors, including Tiger Global, Accel, Microsoft, Naspers and eBay, remain on Flipkart’s capitalization table, although Tiger Global and Accel—Flipkart’s two earliest investors—have sold a small portion of their holdings from their earlier funds as part of this deal. Mint reported on 2 May that Walmart, the world’s largest retailer, is in final negotiations to buy a majority stake in Flipkart even as a rival combination of Flipkart and Amazon looks increasingly unlikely. Walmart and some Flipkart investors, including Japan’s SoftBank Group Corp., are yet to agree on the final details and a deal could take at least a month to be signed, the report said. The Walmart-Flipkart negotiations have been reported by Mint and other publications for several months now. The Economic Times newspaper first reported about the negotiations in January, although it had said that the deal would be a minority investment. 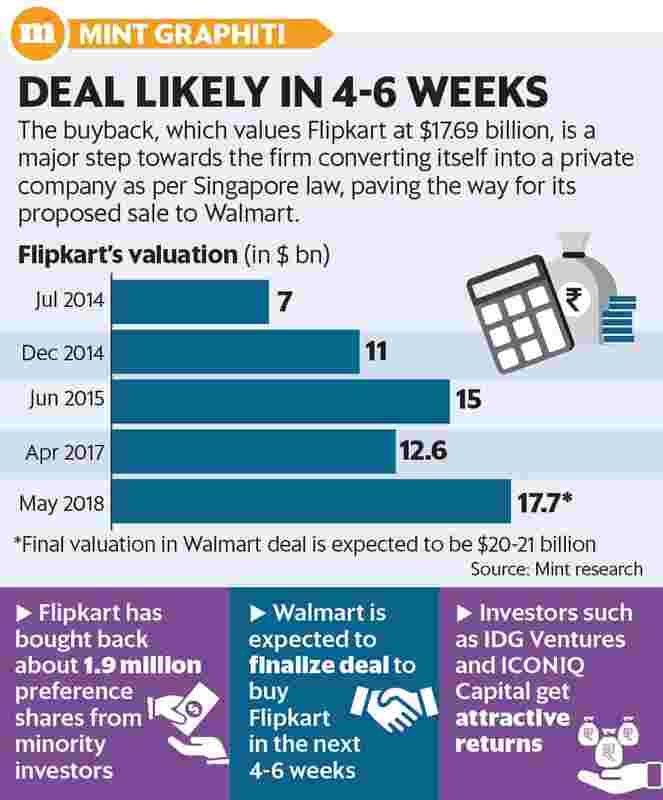 The buyback also appears to be the first somewhat public confirmation from Flipkart of its current sale talks with Walmart, which will buy at least 55% of Flipkart in a deal that will value the company at $20-21 billion. Walmart may end up spending anywhere between $8 billion and $12 billion to buy a majority stake in Flipkart, and is expected to increase its shareholding in the online retailer in a phased manner. Mint reported on Wednesday that Walmart also wants Flipkart co-founders Binny Bansal (group chief executive officer) and Sachin Bansal (executive chairman) and CEO Kalyan Krishnamurthy to continue in their roles after the acquisition. Binny Bansal and Krishnamurthy, a former executive at Flipkart’s most influential shareholder Tiger Global Management, are likely to stay back after the deal. Sachin Bansal hasn’t yet taken a decision on his future or how much stock he will sell in the proposed deal but he is also likely to stay on.